Everyone is buzzing with excitement here in Revel as the massive operation that supports the Tour de France is currently rolling into town to set up everything that goes with one of the world’s greatest sporting events. 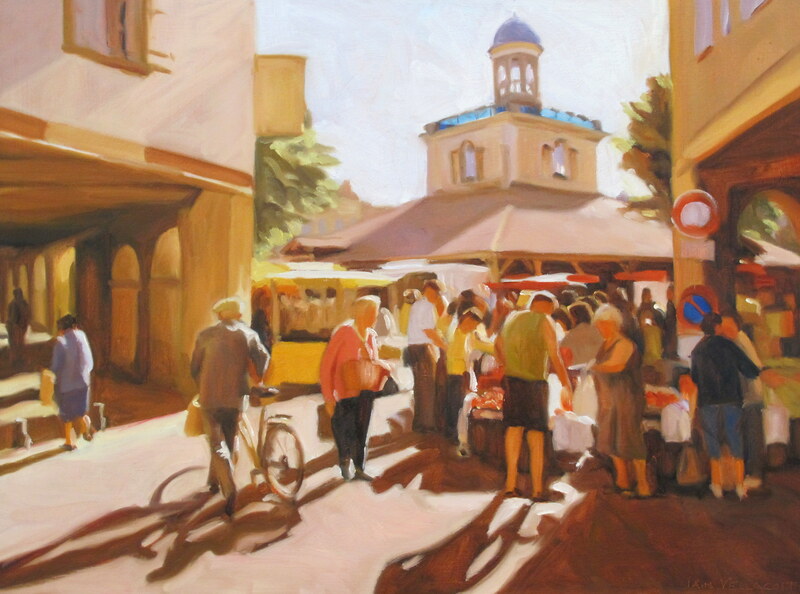 This is an oil painting that I have just finished of the last time that the Tour came to our town in 2013 when they cycled down from Lac de Saint Ferreol and past my friend Nicholas’ shop on the Commerce roundabout. Tomorrow’s finish is going to be even more exciting as the riders will come into Revel from Castelnaudary and then (after passing through this roundabout but going other way to my painting!) head up the steep and long 2km hill to the lake before making a fast and winding descent back down with a final flat 3km to the finishing line in the town. With the possibility of rain showing on the meteo this could be one of the most challenging and exciting final 10kms of this year’s race. I have picked myself a spot just up the hill from the roundabout from where, once they have passed, I am planning on dashing round to the finish on the other side of town before they arrive. Hoping for another Brit victory to help fend off some of the ribbing I have been getting about the football, Brexit, etc! 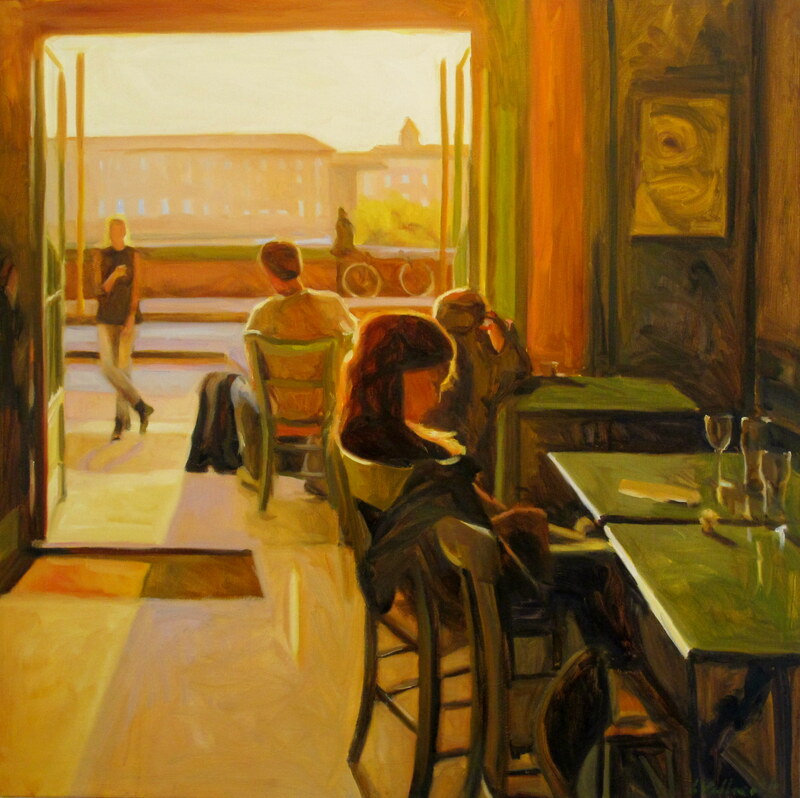 I am back in Winchester again for this year’s Winchester Day on Saturday with a series of new paintings of the College that I have done over the last year. Just hoping for a little sun like there was in this scene of boys crossing Kingsgate Street going back to their boarding houses. I feel very honoured to have been included in the “Humans of Toulouse” project, which you can read here. And do try to have a look at some of the other stories of far more inspirational and deserving people, all told with great journalistic dexterity and some fabulous photography. 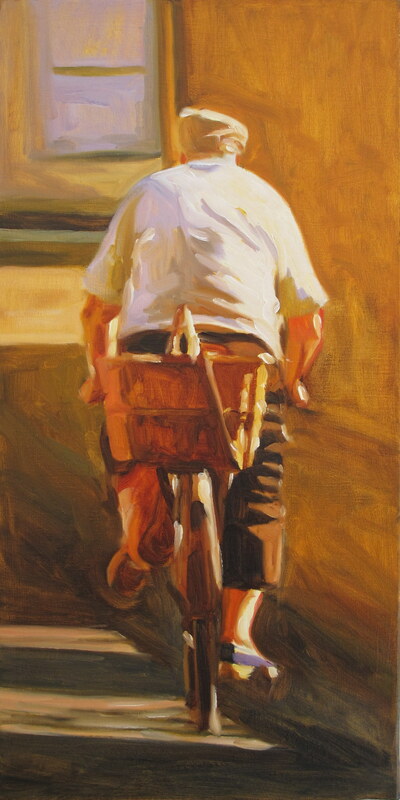 I love this new 3 minute video by In The Pocket Films (aka my youngest son, James) of Aldo Balding painting a self portrait in his studio at Carcassonne, south west France. The music is by Dexter Britain. 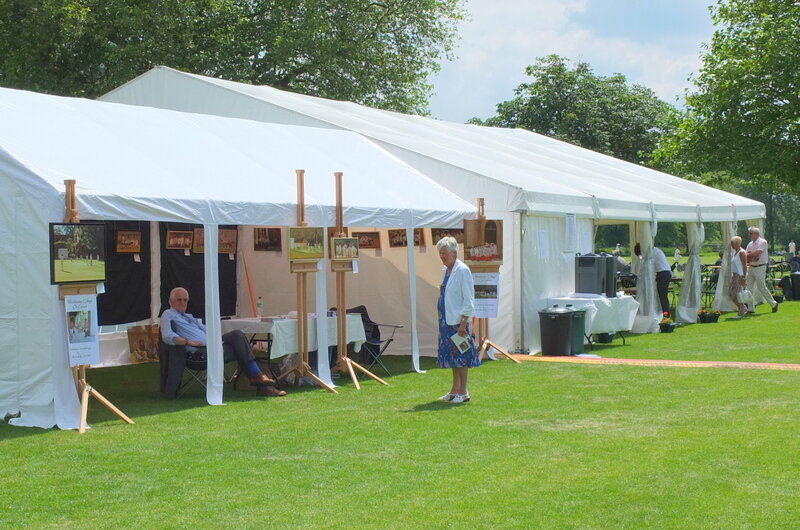 I have an exhibition of my paintings at next week’s Winchester Match – on Saturday 20th June 2015 in a marquee in front of Science School. 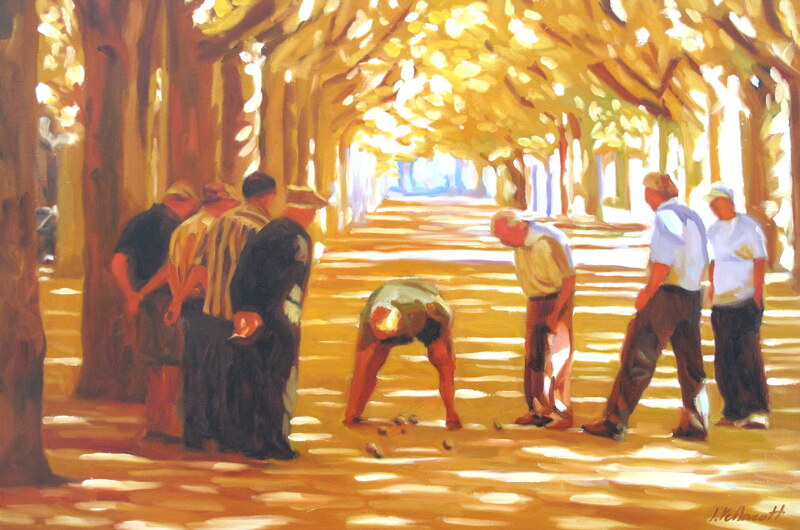 This is a game of Winchester Football (or “Winkies” as it is known to Wykehamists) – a cross between soccer and rugby played between two nets and a tightly tied rope that runs all the way down each side of the “canvas”. 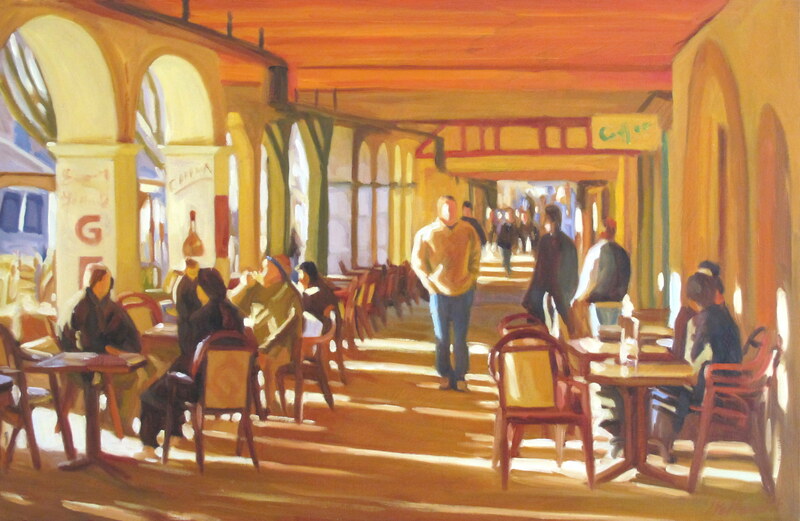 I was delighted to exhibit my paintings of Winchester College at the recent Winchester Match. The one day exhibition was a great success. Here my mother (my greatest marketer!) waits to pounce on some unsuspecting Old Wykehamist! The brochure for my forthcoming exhibition at Winchester College is now out and has resulted in the number of pre-sales moving into double figures. 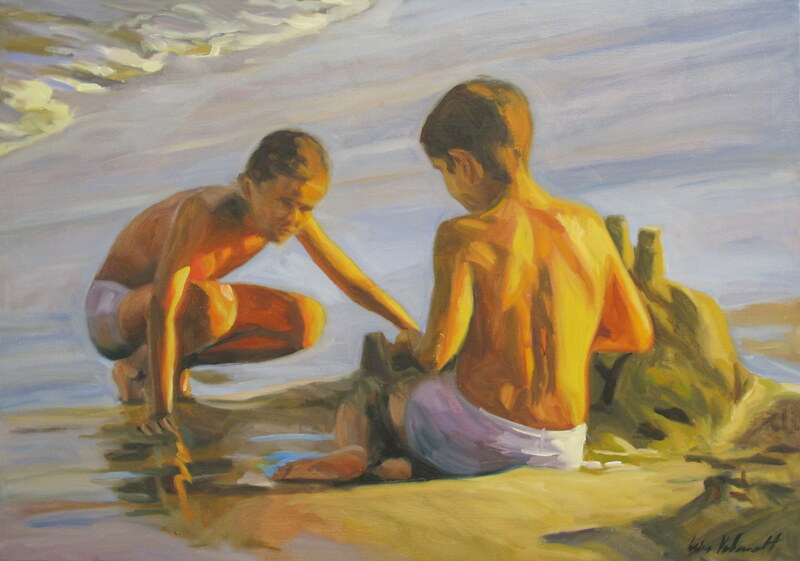 The paintings can be seen on my website at www.inoils.com – click on the Win Coll tab at the top. Le soleil arrive à Revel – enfin! 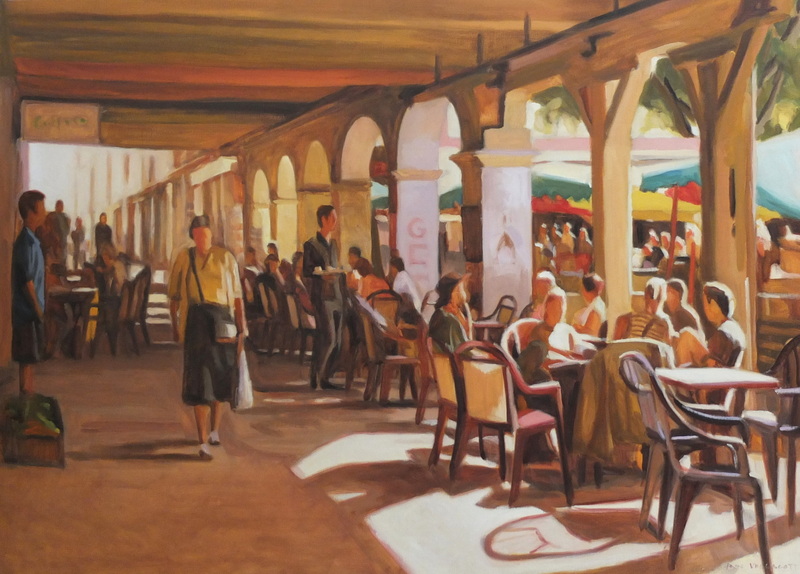 Finally got around to updating my website at www.inoils.com and have included the new paintings of Winchester College that I have done for my exhibition at the school in September. Please accept my apologies for not having updated my blog for so long – this year I have been rushing around trying to earn some money to help support my 3 teenage sons who want to return to the UK for their university studies. 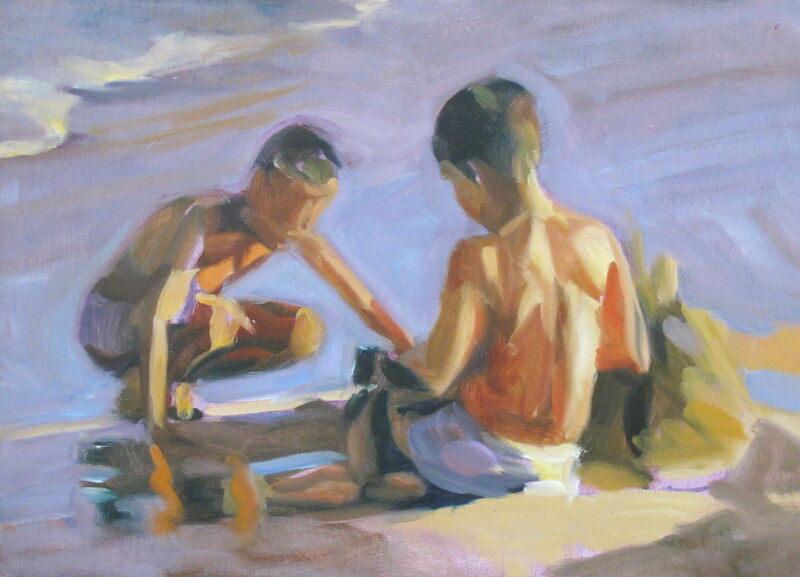 But I am hoping to now have some time to paint, and in particular to get together a collection of new paintings for an exhibition that I have at Winchester College in September 2013. 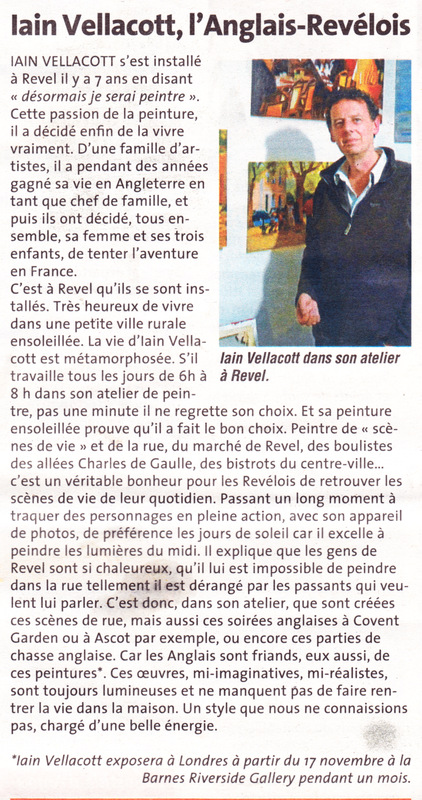 I was invited recently to exhibit a selection of my paintings at Credit Mutuel here in Revel and this is the article from this week’s Voix du Midi. I actually totally forgot about the appointment with the journalist but luckily their PR lady called me to ask where I was – and when I turned up their were lots of Directors and they kindly cracked open a bottle of champagne – at 11am! 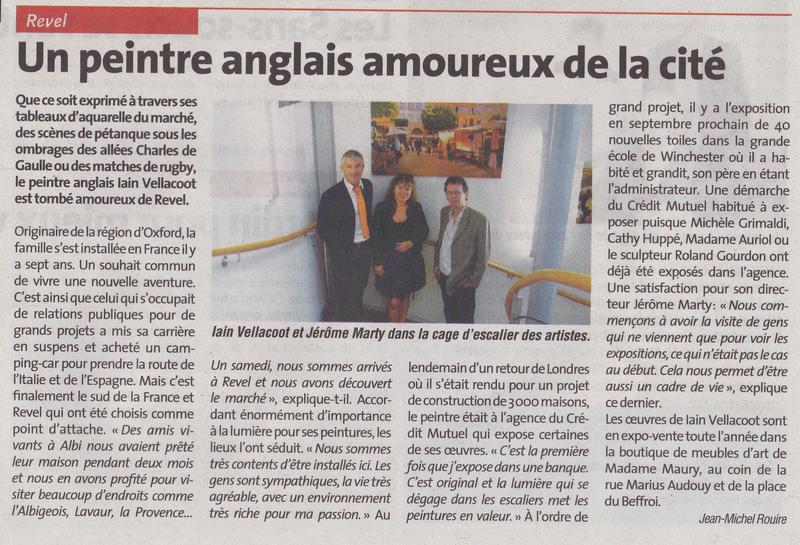 Very kind and very French! It may also explain the spelling of my name and why the article refers to watercolour (aquarelle) rather than oil painting! I am flying back to the UK next weekend for the annual Commoners vs OTH Winchester College Football (“Winkies”) match. 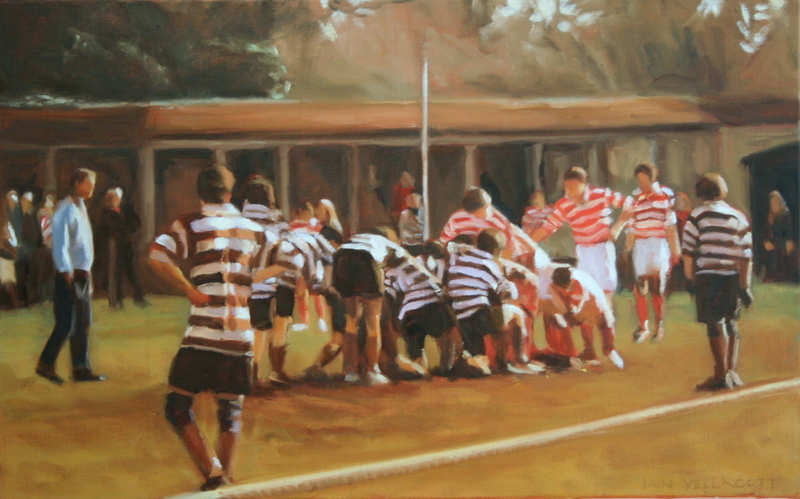 This is one of the paintings I did of the match 3 years ago and I am hoping for some sun next weekend as I start to paint pictures for my next Winchester exhibition in March 2013. I am delighted that Madame Maury has kindly asked me to exhibit my paintings of Revel in her fabulous antiques shop over Christmas. Madame Maury’s shop is at the bottom of this arcade on the right. 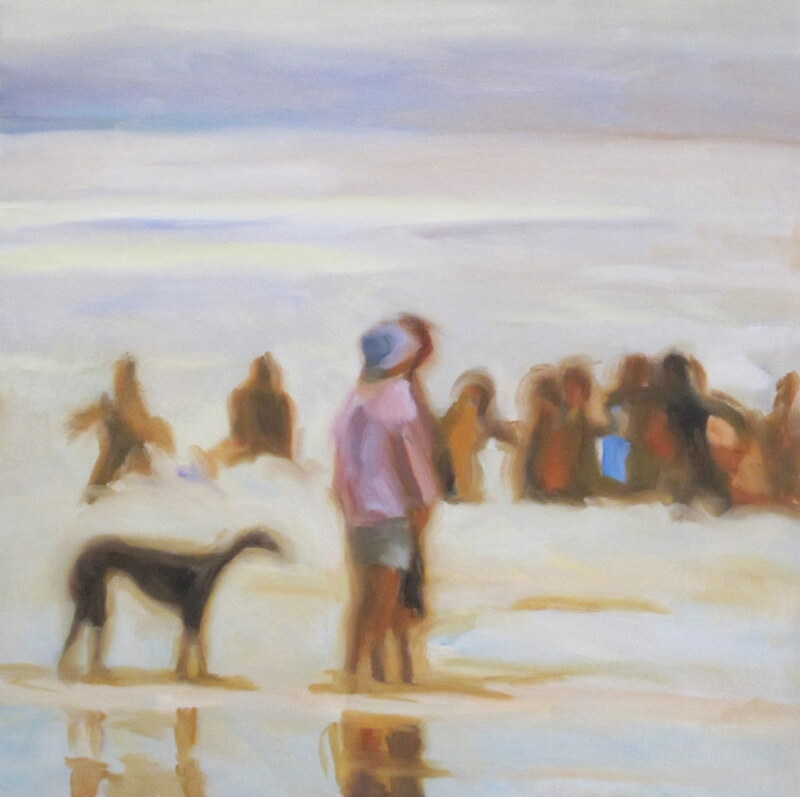 Nowadays I normally feel that my paintings are generally better hung unframed so as to avoid the light and atmosphere that is the main focus of most of my pictures being constrained by a physical border. 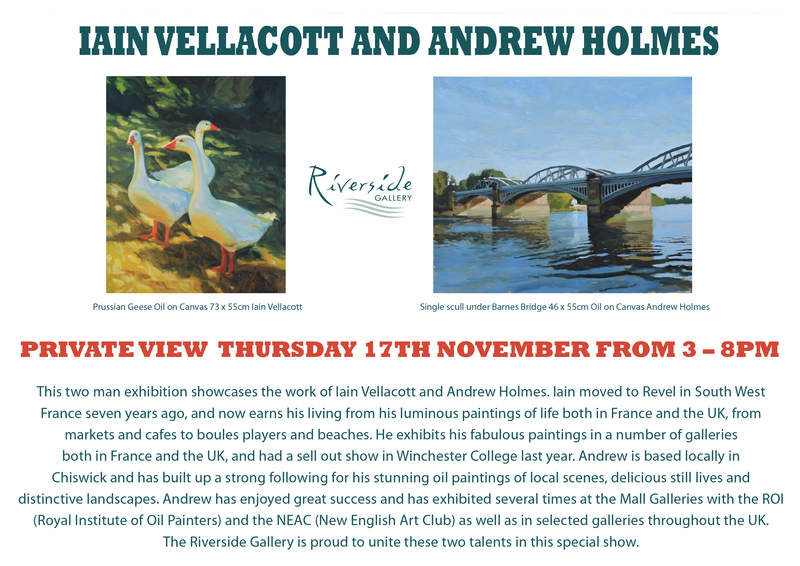 However, as part of my current joint exhibition, the Barnes Riverside Gallery has kindly put some of their fabulous frames on a couple of my paintings – and I have to say that I think that they really work! 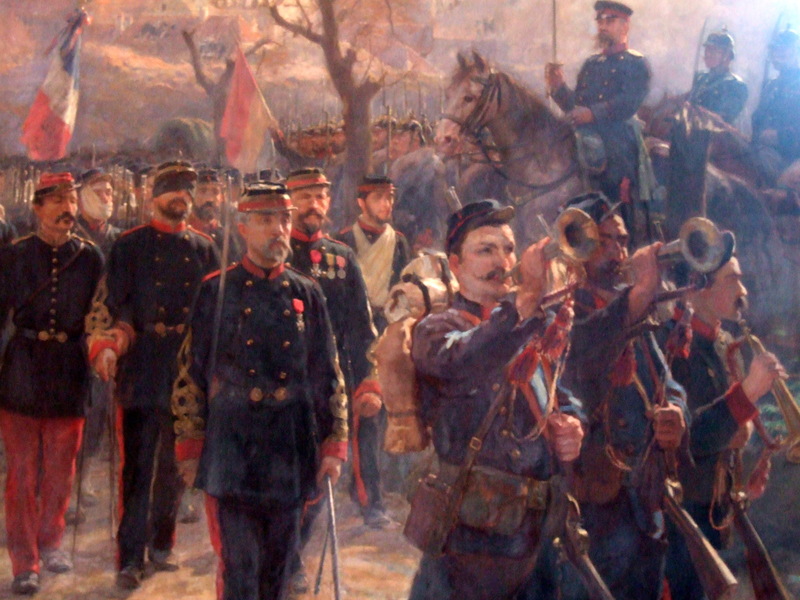 The exhibition runs until 14th December. 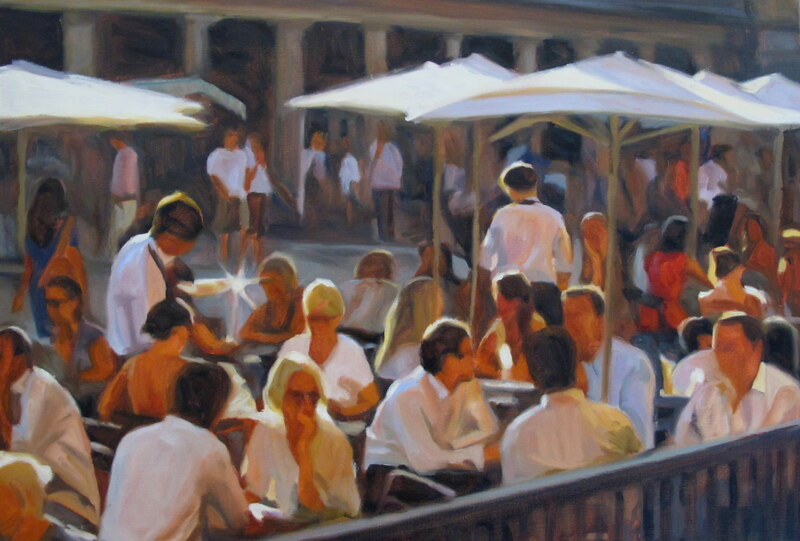 This is a painting of Covent Garden for my exhibition at the Barnes Riverside Gallery in London in November. 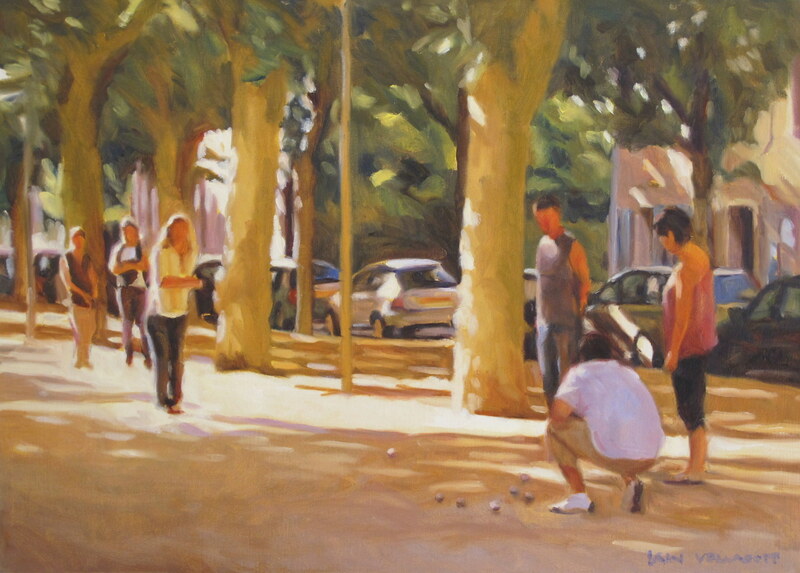 And following the sketches this is the final painting – 92 by 65cm painted on a light mauve ground. 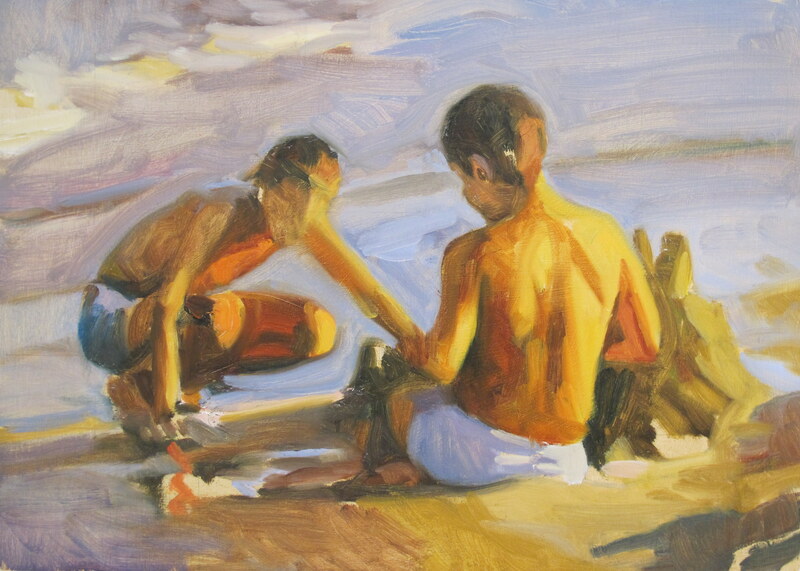 Following my recent trip to Valencia and the beaches around Javea where Sorolla painted, I have been doing some sketches for a new beach painting of my own. Both of the above sketches have been done on poor quality board – the first is on a mauve ground (ultra plus cad red medium), the second on a yellow ochre/violet ground. I am currently working the sketches up into a larger painting. 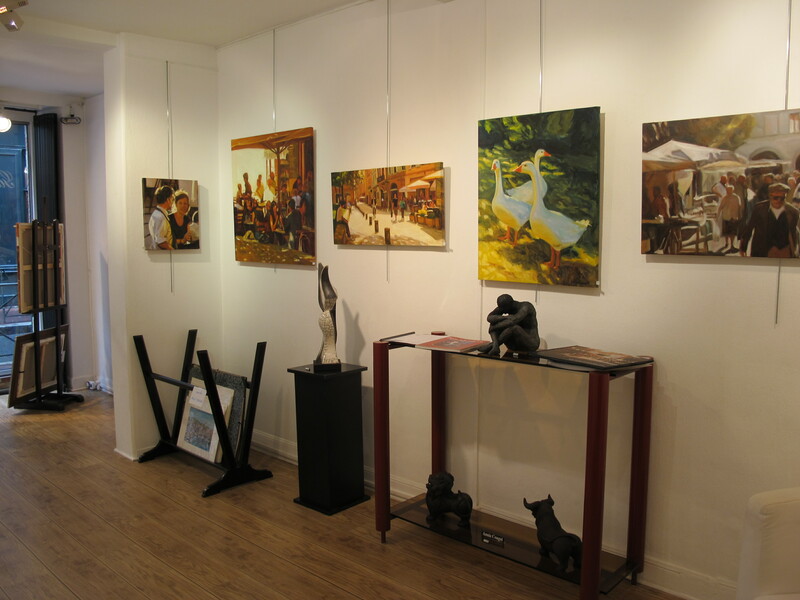 The exhibition is at 9 rue Fermat (near St Etienne) until mid-July. 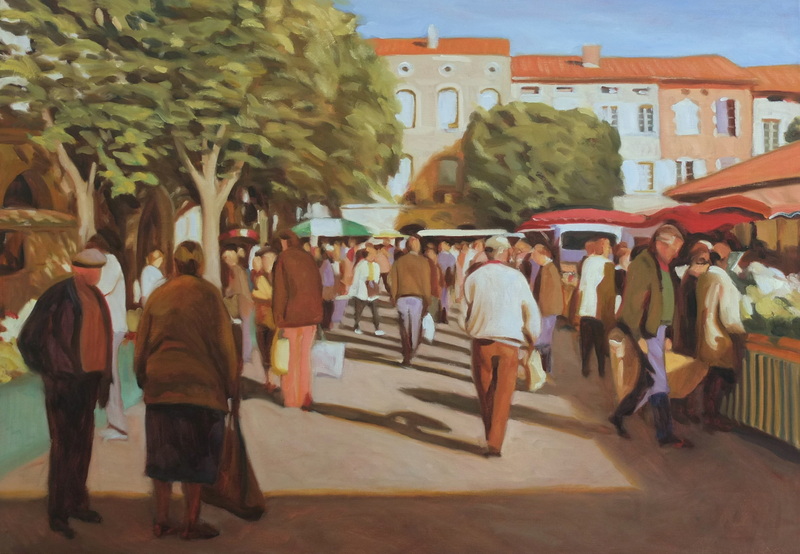 This is my latest painting for my forthcoming exhibition at Galerie Roger Betti in Toulouse (rue de Fermat – just round the corner from Cathedral St Etienne) which is due to run from 7th June to 12th July. 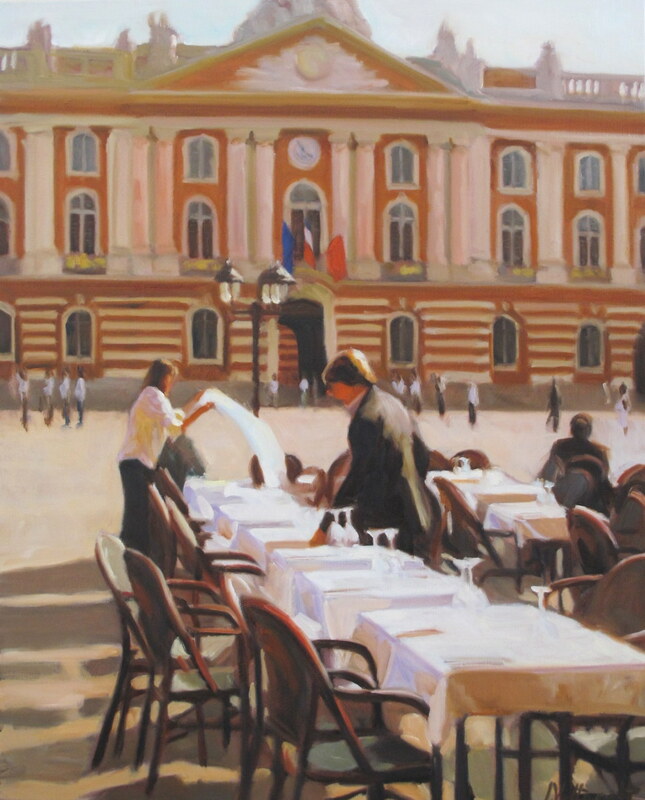 Le Cafe des Artistes is a wonderful cafe/bar on place de la Daurade overlooking the Garonne and is frequented by many of the artists from the nearby école supérieure des beaux-arts. 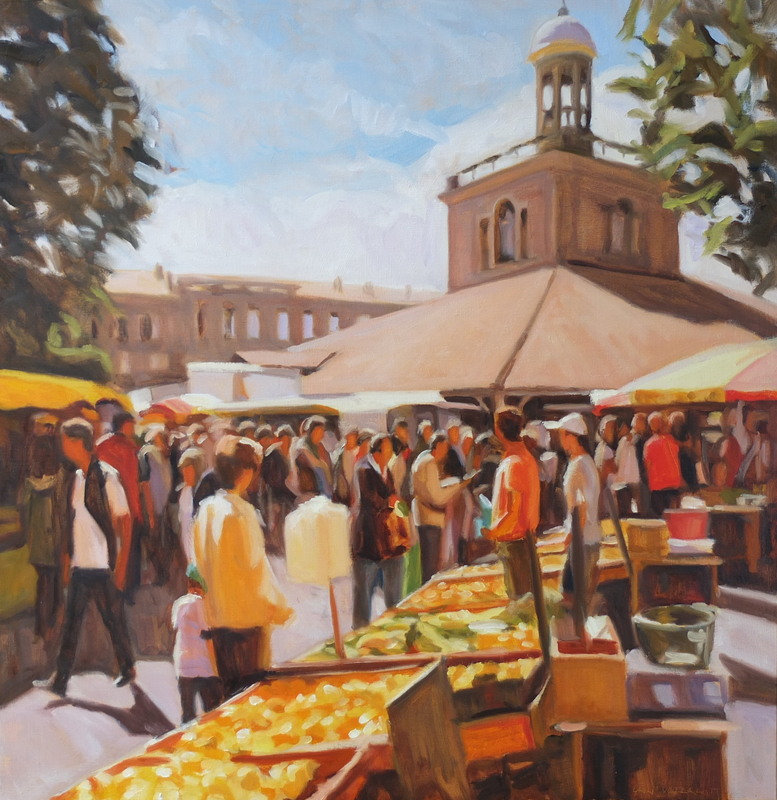 This morning’s market was stunning – packed with people, the asparagus just coming into season and the light was magical and retained its colour through to lunchtime. 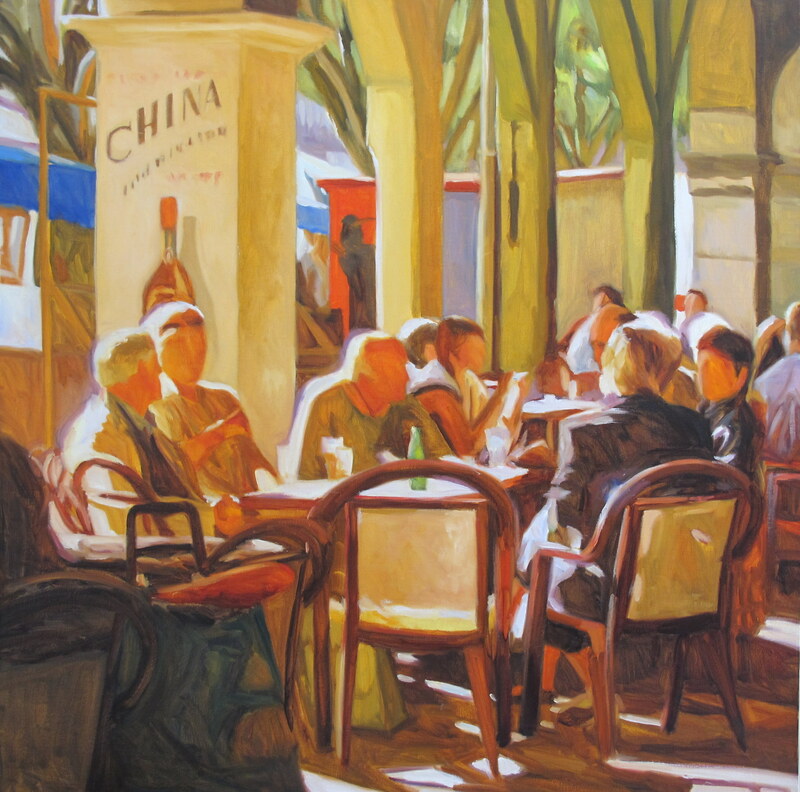 I bumped into the people who are in this new 1m by 1m painting in the same arcade cafe – is there anywhere better to spend a Saturday morning? 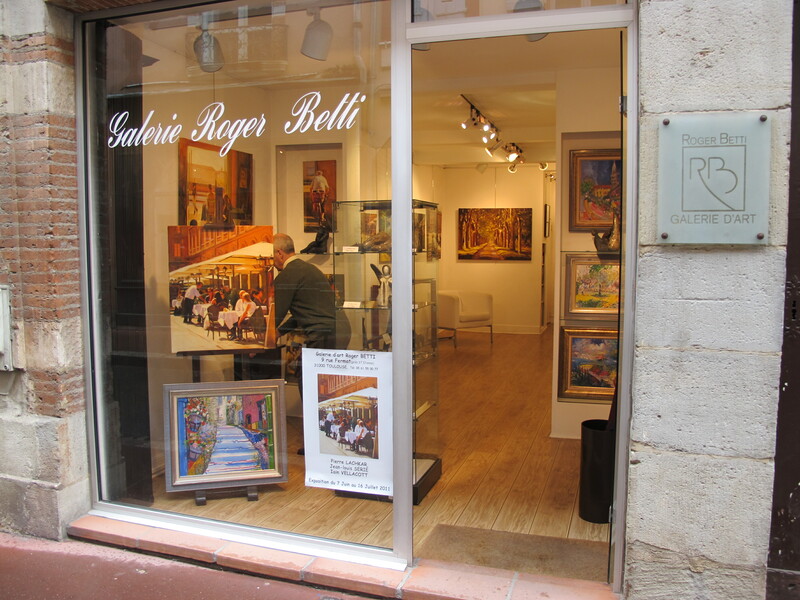 I have spent quite a bit of time in Toulouse over the past year as I prepare for my exhibition at Galerie Roger Betti in the city in June/July. 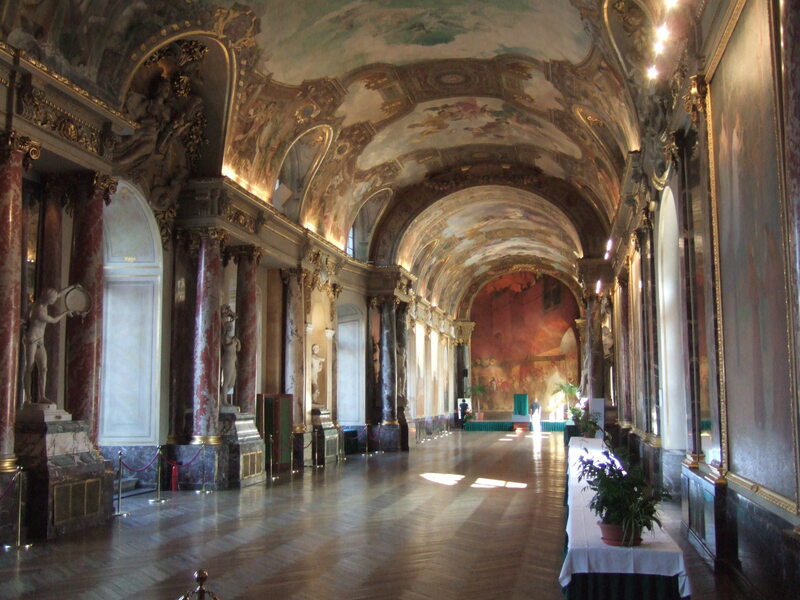 One of Toulouse’s best kept secrets is the fabulous 19th century paintings that hang in “La Salle des Illustres” on the first floor of the Capitole building – there are no signs (or at least none that I could understand!) and the place was totally empty when I last went. 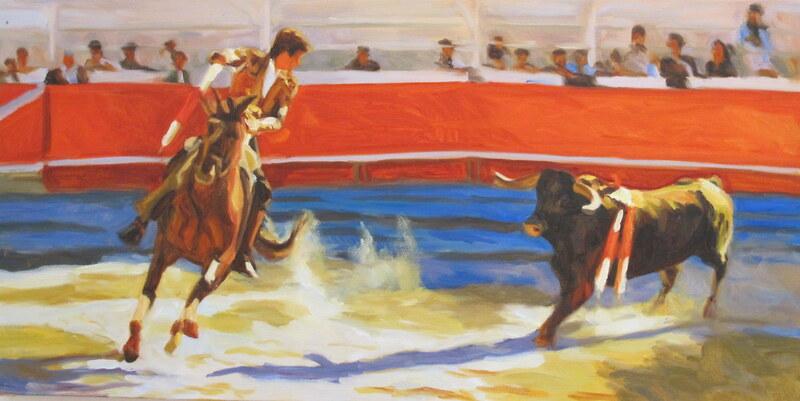 I don’t usually “revisit” paintings but I did a painting of a Hunt Meet about 18 months ago that has been bothering me ever since. Last week I finally plucked up the courage to change a number of aspects of the original, including putting more colour into the picture and changing what I felt was a far too sombre sky. 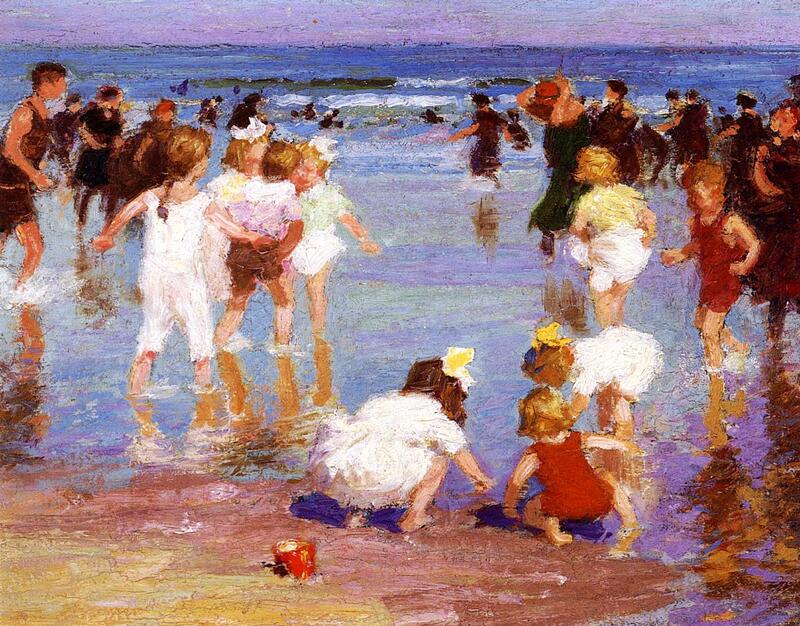 I am in the process of changing a number of colours on my palette and have added Prussian Blue, a strong staining colour that Sorolla used to great effect in many of his beach scenes. 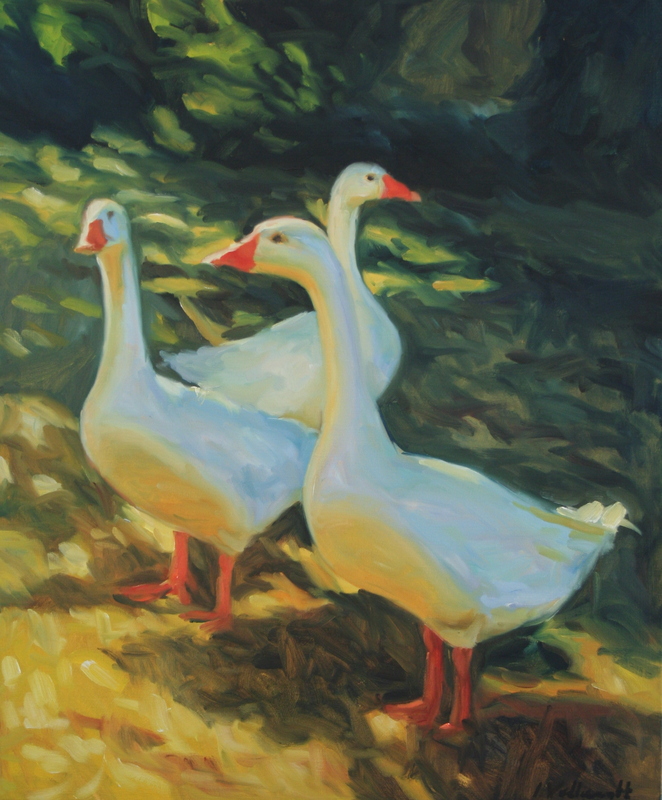 This painting, which is called “Geese with Attitude”, uses quite a bit of Prussian Blue in the cool shadows. 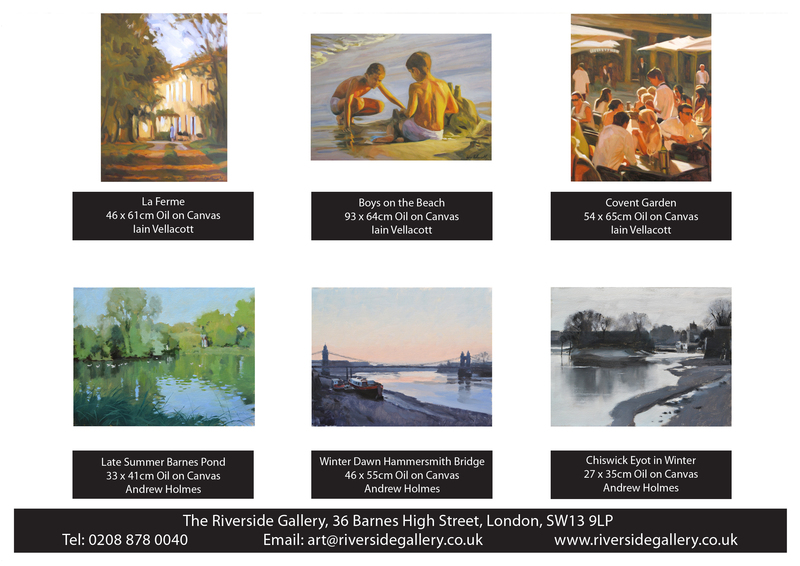 I am delighted to have been asked to exhibit at the Riverside Gallery in Barnes, London. 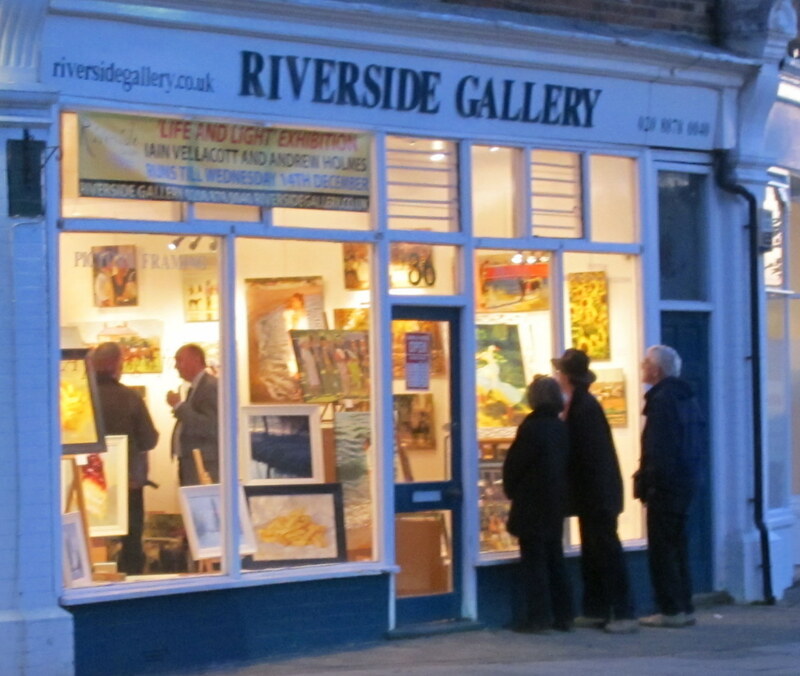 The gallery enjoys a wonderful position on the mini-roundabout by the Thames at the end of Barnes High Street and has some great artists including Rod Pearce, Tony Merrick, Colin Orchard, Gillian Furlong and Valerie Davide. 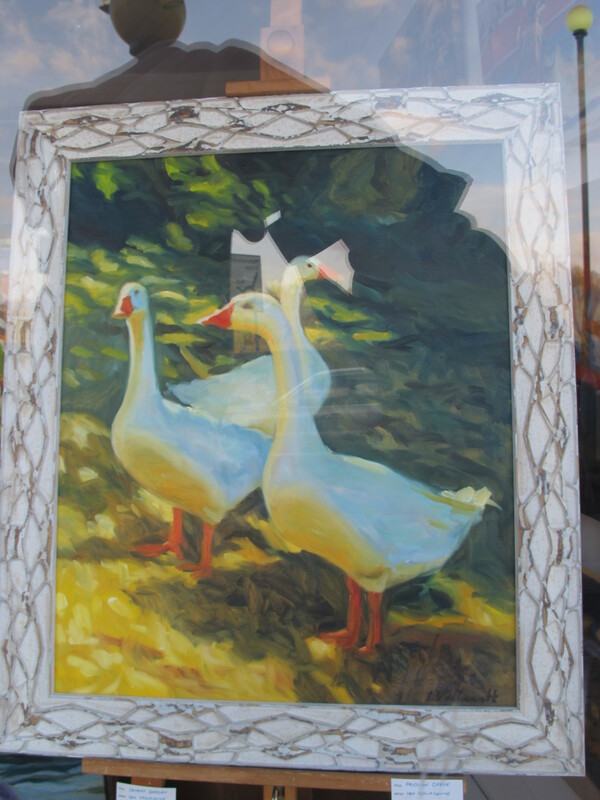 I happened to drive past the gallery a few weeks ago and was so taken by the paintings in the window that I felt that I had to stop to take a better look. And I was so taken by the gallery and its fabulous manager, Kat, that I had no hesitation in accepting their kind invitation to exhibit with them. This is one of 4 paintings that I shall be exhibiting at the CHASE Contemporary Art Exhibition being held at the Royal College of Art in central London on the evening of Thursday 4th November. Over the past 10 years the annual art exhibition has raised in excess of £1m towards the work of this excellent charity. Tickets for the evening, which will be attended by HRH the Countess of Wessex and a number of celebrities, cost £65 each and can be bought here. 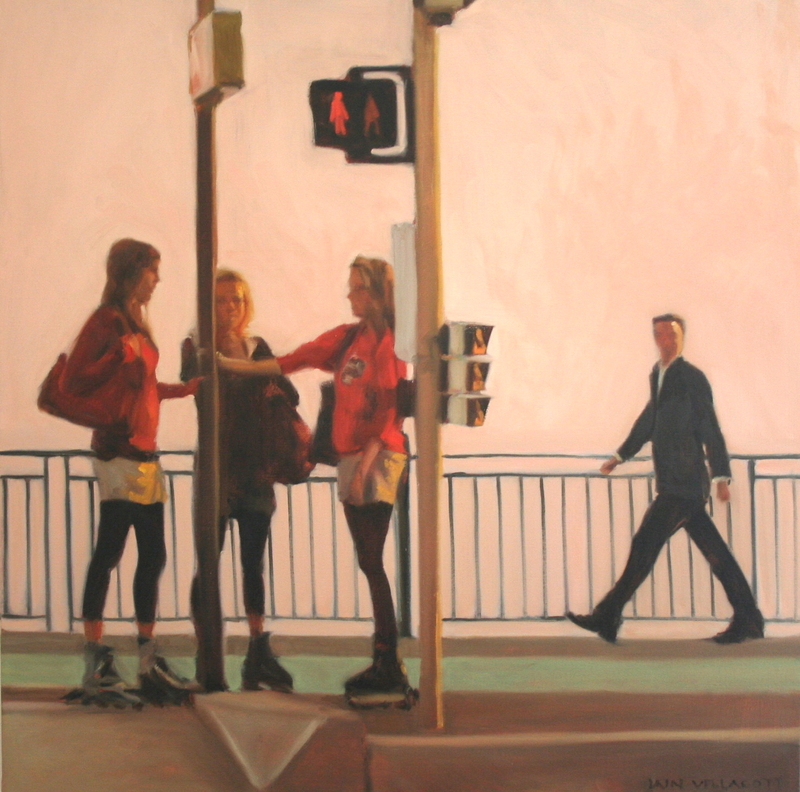 I was so pleased to receive an invitation today to Sarah Drake’s first group exhibition which is coming up in London. 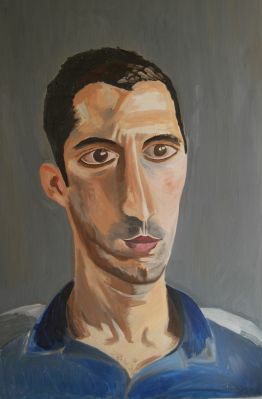 Sarah, my wife’s first cousin, has been studying portrait painting at Heatherleys School of Fine Art in Chelsea and I am really impressed by the quality of her new “perceptions” series. 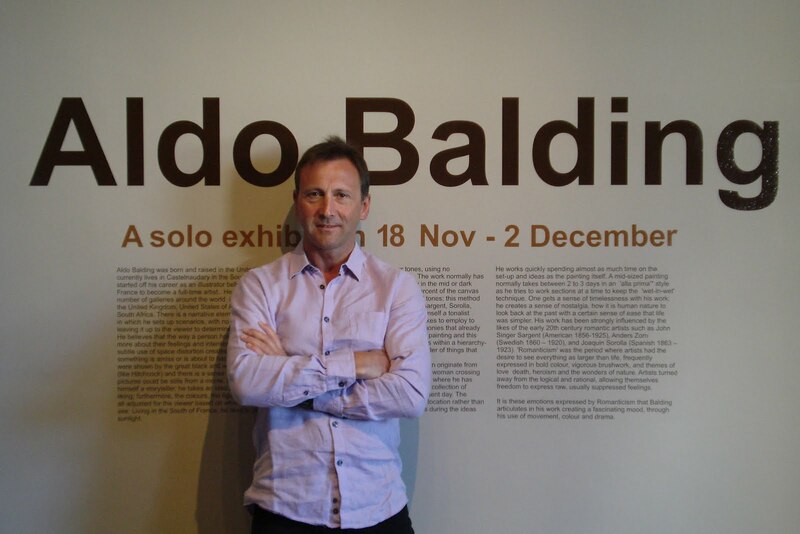 The exhibition is at the Lennox Gallery in Fulham from 2nd – 7th November (11am – 6pm). 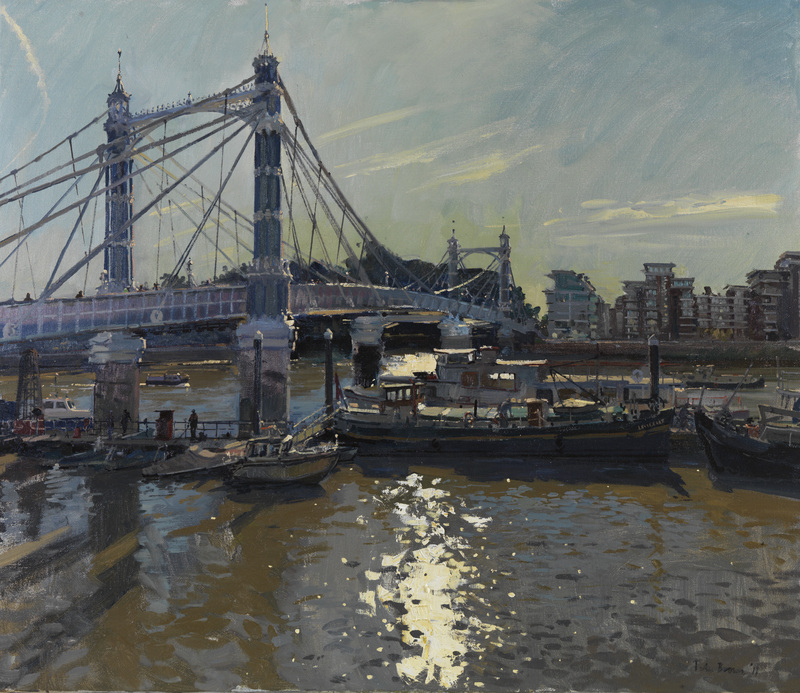 And talking about exhibitions, Peter Brown also has one on at Messum’s at the moment. 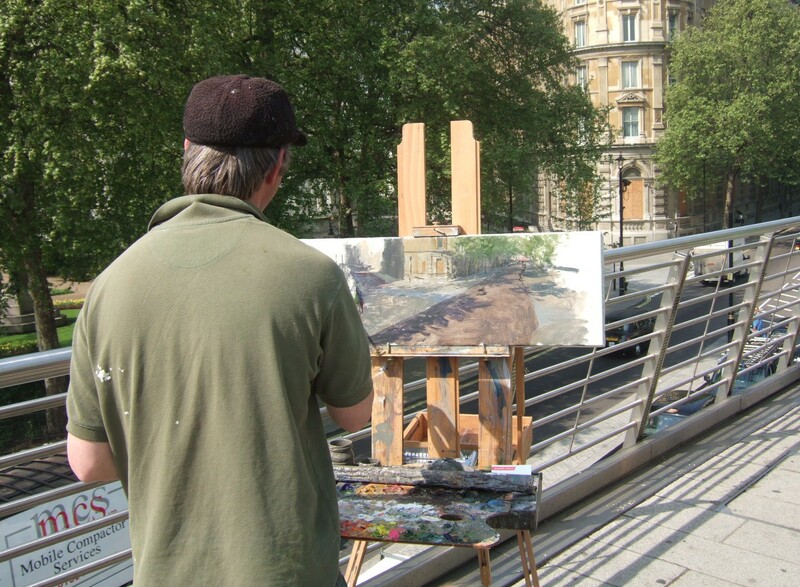 I first met Pete over 5 years ago when I was walking over Hungerford Bridge in London and he was just starting a painting looking down into Northumberland Avenue. 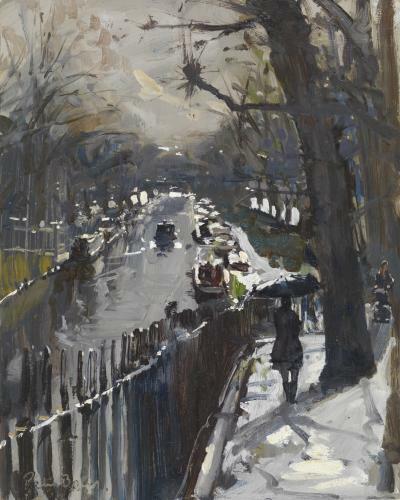 Pete not only has incredible talent (surely an RA in-waiting) but he keeps challenging himself with new and often difficult subjects – to set up one’s canvas on a London street and paint totally from life is impressive enough but he can also find light and atmosphere in the rain and even at night. 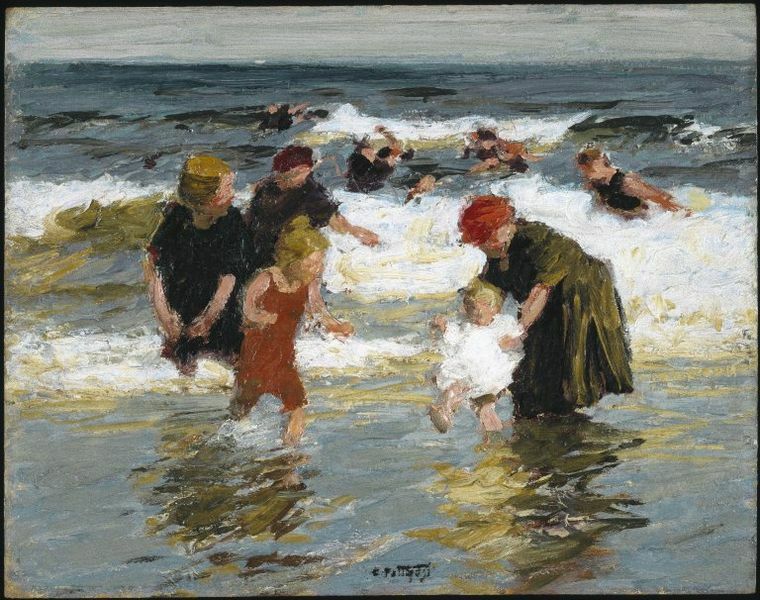 To me, what is great about this exhibition is the way that, having thought he couldn’t get much better, there seems to be even more atmosphere, sparkle and fun in his new work. 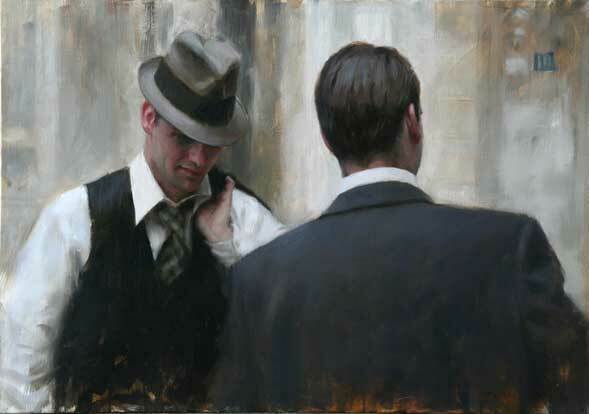 My good friend Aldo Balding, one of the UK’s leading figurative and portrait painters, currently has an exhibition at London’s Catto Gallery of some of his stunning pictures. 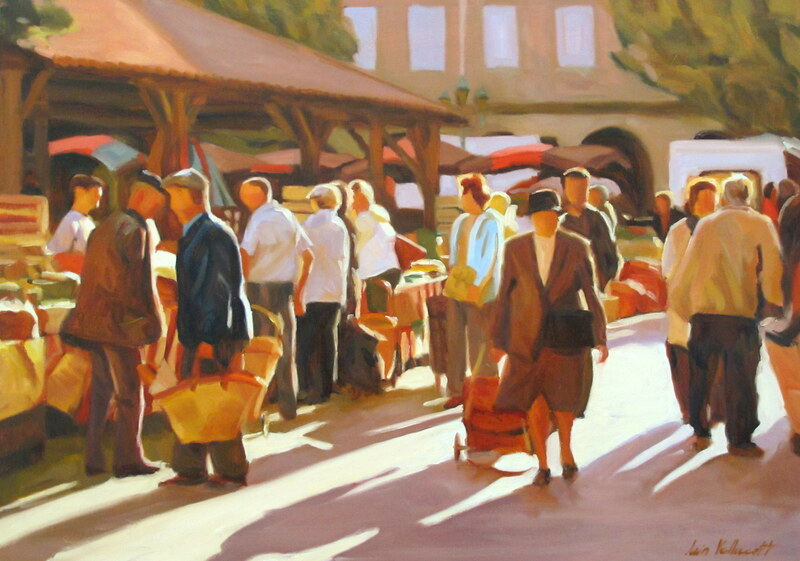 I met Aldo on a plane traveling back to the UK about 5 years ago when we discovered that we lived only about 15km from each other here in South West France. 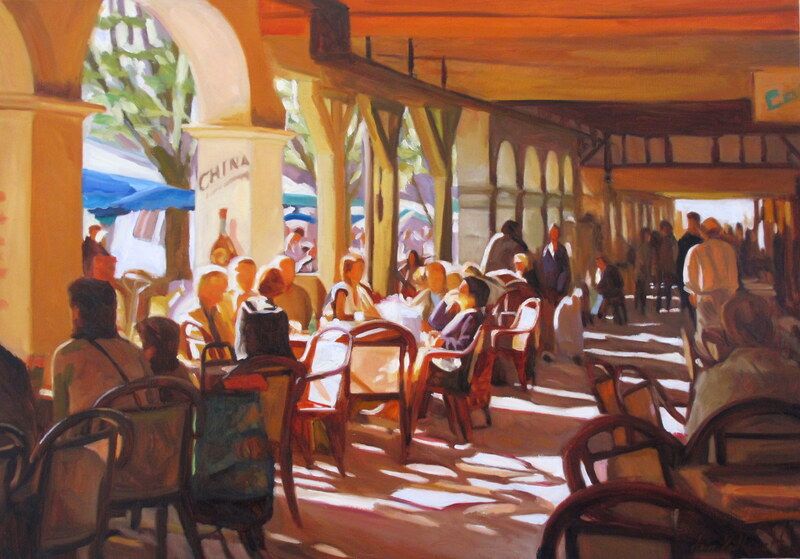 Since then Aldo has given me a significant amount of help and guidance with my painting (he is a really great teacher) and I continue to be in awe of his mastery of his art and the power of his work. 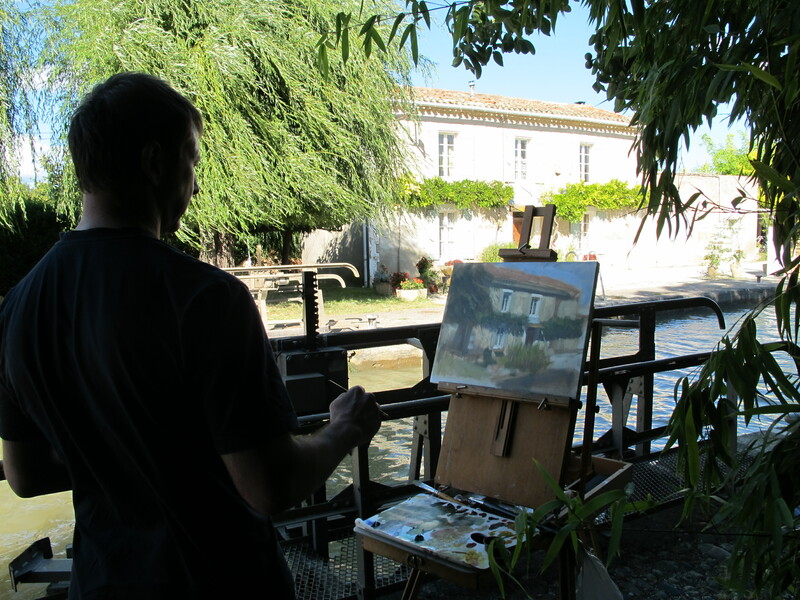 A couple of weeks ago Aldo and I spent an afternoon painting a lock-keeper’s house on the Canal du Midi. 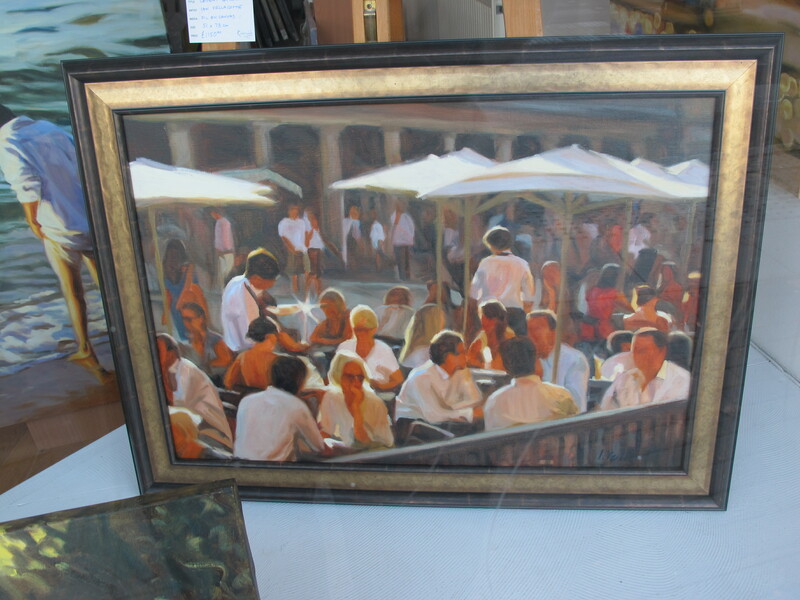 Despite the wind (which almost blew my easel into the canal) Aldo still managed to produce a fabulous painting, as below.